Identifying Your Pest – with Poop? Whether you are dealing with a pest problem, having car trouble, or trying to figure out who stole the cookie from the cookie jar, your job starts with an investigation — the information-gathering step where you search for clues. In pest management, inspection is the first and most important step toward addressing an issue, helping you discover what pest species are present — and why. Here’s the scene: you’re inspecting a dark basement and happen upon some droppings. If from a rodent, your next step might be to look for more droppings, sebum trails (oily marks) that show where rodents have traveled, or chew marks. These clues help you determine how rodents are entering the building and where they are finding food, water and shelter. But fi the droppings are from cockroaches, your inspection will shift to looking for wet, decaying organic material and harborage areas. For pest ID at work or at home, your eyes are your best tools — helped, perhaps, by a magnifying lens. But how do you tell the difference between the droppings? Rodents dropping are relatively smooth and often pointed or tapered at one end Mice are smaller critters, so their droppings are typically less than ¼ inch long, whereas rat droppings are larger than 1/3 inch. Rodent droppings might also contain hair — rodents swallow it as they groom themselves. Like other insects, cockroaches have structures called rectal pads that are used to absorb water and nutrients before their poop leaves their bodies. The orientation and shape of these pads gives insect droppings unique shapes. 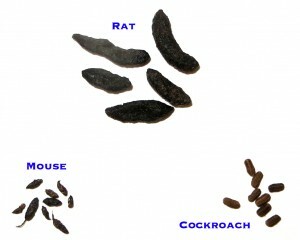 In the case of cockroaches, droppings appear to have ridges. For more information, see this pictorial key to rodents. By conducting a thorough inspection and correctly identifying pests, you can develop an action plan to reduce their populations and prevent them from coming back.